The pulp of a tooth is the inner, central core of the tooth and contains blood vessels and nerves. Dental caries (cavities) and trauma to the tooth are the primary reasons for children to undergo pulp therapy. The main purpose of pulp therapy is that the tooth is not lost. Primary teeth are needed for chewing and speaking and serve as space savers for permanent teeth. Without the primary teeth to guide them, existing neighboring teeth can crowd in, causing permanent teeth to grow in crooked or tilted. Vital pulp therapy is for cases in which the tooths pulp may be salvaged. The main purpose is to maintain and protect existing healthy pulp by removing the diseased pulp tissue within the crown portion of the tooth. Next, an agent is placed to prevent bacterial growth and to calm the remaining nerve tissue. This is followed by a final restoration (usually a stainless steel crown). diseased pulp tissue is completely removed from all parts of the tooth. The canals are cleansed and filled with a special material meant to be naturally absorbed by the body while the root prepares for the primary tooth to fall out and be replaced by a permanent tooth. 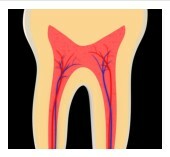 A crown is placed on the tooth to prevent fractures. If the pulp is severely damaged then your doctor may recommend removing the tooth entirely. If this is a case ask if space maintainers are necessary for future development. If you live in or around Irvine and you suspect your child is in need of pulp therapy, contact our office or schedule an appointment for a consultation today.